2014 April 8, mount gridded and detail drawings updated. 2014 March 18, page and mount drawing updated. Also updated are the views on the day room cabin trunk page that include the mount (starboard, top, and aft views). 2009 January 23: Page added. 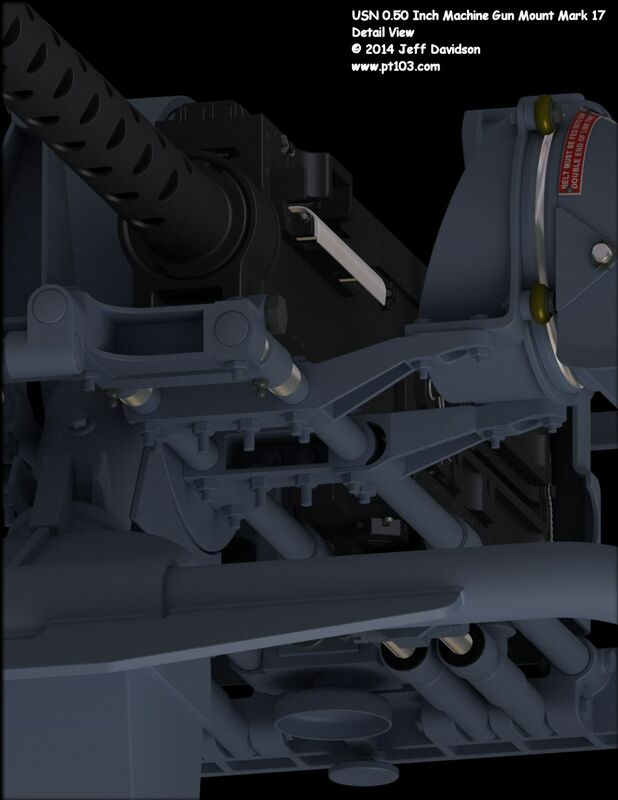 The following image shows dimensions for an USN 0.50 Inch Mount Mark 17 as used on PT boats. These drawings are mostly a guess based on mount images and the general drawings in the March 1943 manual 0.50-Inch Machine Gun Mounts, Mark 17 Mods. 1 and 2. Please confirm dimensions given here for yourself if errors cannot be tolerated. Images are for non-commercial personal use only, please obtain permission for any other use. A special thanks to Jerry Gilmartin who took some measurements for me from an actual carriage on PT 658. Jerry also supplied Richard Pekelney of hnsa.org with the Mark 17 mount manual for scanning. Additional Mark 17 mount information, including text descriptions of the Mod. 0 hand brake and bearing train, can be found in the February 1943 Motor Torpedo Boat Manual. 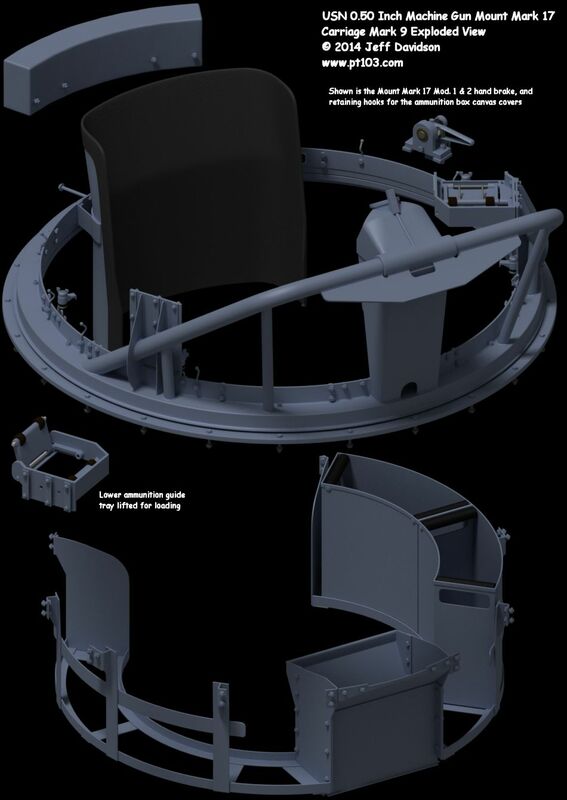 Also available on the hnsa site is the turret mount found on certain earlier PT boats, The Dewandre-Elco Power-Operated Machine Gun Turret. The Mark 17 mount included the Cradle, Mark 9 and Carriage, Mark 9. The cradle remained the same while the carriage went through 2 modifications by the manuals date of March 1943. From the movie "They Were Expendable"
1. 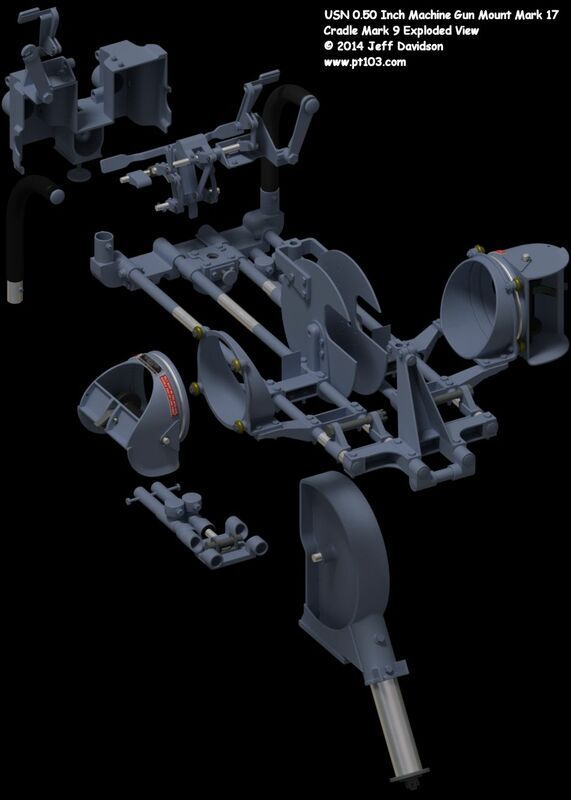 The Bell Aircraft twin cradle for .50-caliber machine guns is a flexible, lightweight, scarf-ring type mount equipped with a hydraulic system to absorb recoil shock. It is designed to be fired by either or both hands. It is manufactured in accordance with Bell Aircraft Corporation drawing 03-038-075. 5. The mount for the twin cradles is housed in a barbette or stand whose circumference is 44 inches. The stand itself contains a roller ring or base built around the inner diameter--the brake band--and carries thereon a roller path. The base of the mount fits inside and next to the brake band at the top portion of the stand. In so fitting, the roller path is encased by the mount base or ring. To provide easy and smooth operation and to anchor the mount there are 24 bearings mounted in the base ring of the mount and moving in the roller path. These consist of one horizontal and one vertical roller mounted on a small plate. The horizontal one rolls against the side of the V-shaped roller path and prevents other than circular motion in the horizontal plane. The vertical roller rides against the bottom surface normally and supports the mount. However, if the mount moves upward from shock, the roller rides against the top surface and thus anchors the mount. The small plate on which the rollers are mounted is secured to the bottom ring of the mount by two screws. It should be pointed out that if it becomes necessary to lift the mount it is necessary to first remove these bearings. 6. The mount has a train of 360° but may be secured in any position by a hand-operated brake. This brake is located just above the base of the mount, being attached thereto, and next to the brake band. It is just to the left of the gunner. Its operation consists merely of moving a hand lever to the ON position. This movement operates two eccentric cams. The motion of the cams pushes out a brake bar which in turn, by means of springs, pushes outward on the brake shoe. The brake shoe rests against the inside of the brake band preventing further movement of the mount. It may be applied in any position of the 360° train. In addition the mount may be locked in one definite position by inserting four securing bolts into four equally spaced threaded holes in the top of the scarf ring. These bolts fit into threads in the roller path which are in line with the holes of the scarf ring. 1. Ordnance Pamphlet No. 951 was prepared from Bureau of Ordnance drawings, and the material furnished by the Bell Aircraft Corporation and the Electric Boat Company. 2. The 0".50 Mount, Mark 17 Mod. 1 differs from the Mark 17 in the use of a new track bearing and a new brake, as well as the addition of a horizontal stowing latch and canvas covers for the ammunition boxes. 3. The 0".50 Mount, Mark 17 Mod. 2 is the MG Mount, Mark 17 converted to include the changes incorporated in the Mark 17, Mod. 1. The Mark 17, Mod. 2 is identical to the Mark 17, Mod. 1 except for the fixed bearing race and the attachment of the outer bearing shield. This conversion affects the carriage only, which becomes Carriage Mark 9, Mod. 2, instead of Mark 9, Mod 1. (a) Train bearing of new design. (b) Hand brake of new design. (c) Horizontal stowing latch. This is an added feature and is used to hold the guns secured in horizontal position. 3. Operation characteristics and installation dimensions of the subject mount are identical with those of 0".50 Mount, Mark 17. The heavy brake ring has been eliminated, and the brake shoe of the new brake operates against the outside of the fixed ring. 5. The gun cradle is supported on trunnions by a yoke which is pivoted on the support structure. This arrangement permits the guns to be manually elevated, depressed, and traversed within the limits set, irrespective of the position of the carriage in train. The maximum elevation is 85°, the maximum depression is 15°, the traverse movement, i.e., the rotation of yoke axis, is limited by stops from 10° to 15° to either side of the center line, depending on elevation of guns. Depression of guns is limited by a circular rail supported by a protective shield or by other suitable means. This depression stop prevents the guns from being pointed at the ship's personnel or structure when the gunner is firing over the boat. (See pl. 1.) The depression-limit stop rail is normally installed by the shipbuilders and shaped according to the mount location and ship's structure. 6. For information on operation and cleaning of gun, see O.P. No. 716 (War Dep't. SNL A 36). Weight of the Mount - without guns, ammunition or protective shield: 495 lbs. Weight of two guns: 130 lbs. Weight of 1000 rounds of ammunition in links: 300 lbs. 1. The carriage of the mount consists of a fixed ring with a flange which is bolted down to the boat's structure, and a rotating structure which supports and carries the cradle, the ammunition-box supports, the spent cartridge and link chutes, a back rest, a counterweight, a hand brake, and the stowing and securing latches. The rotating structure of the carriage is supported on a large rotating ring and the fixed ring; the two rings compose the roller-bearing path for training the mount. 2. The train bearing consists of a single complement of cylindrical, solid rollers. Assembled in the raceways are 105 rollers caged in 15 circular separator strips, each strip holding 7 rollers. (See pl. 5.) The axes of the rollers are inclined 45° with respect to the axes of the raceway rings, but in each separator strip the axis of one roller assumes alternate position with respect to the axes of the other six rollers. Consequently, in the train bearing 15 rollers take the upward load and 90 rollers take the downward load of the carriage. 3. The hand-brake assembly is bolted on the pads provided on the rotating support ring (see pls. 4 and 6). With brake handle locked in horizontal position to the left (with reference to operator inside the turret) the brake shoe should be clear and free from the brake surface, i.e., the fixed ring of the carriage. 4. To hold the mount in train in any fixed position, turn the brake handle 180° to the right for maximum braking effect. The hand brake may also be used to apply varying degrees of braking effort by engaging the brake-handle detent in any one of the three intermediate notches provided on the cam surface of the brake bracket. 5. Ammunition to the guns is supplied from four boxes, two per gun, each having a capacity of 250 rounds, or 500 rounds per gun. Ammunition boxes are carried on supports attached to the rotating carriage structure. 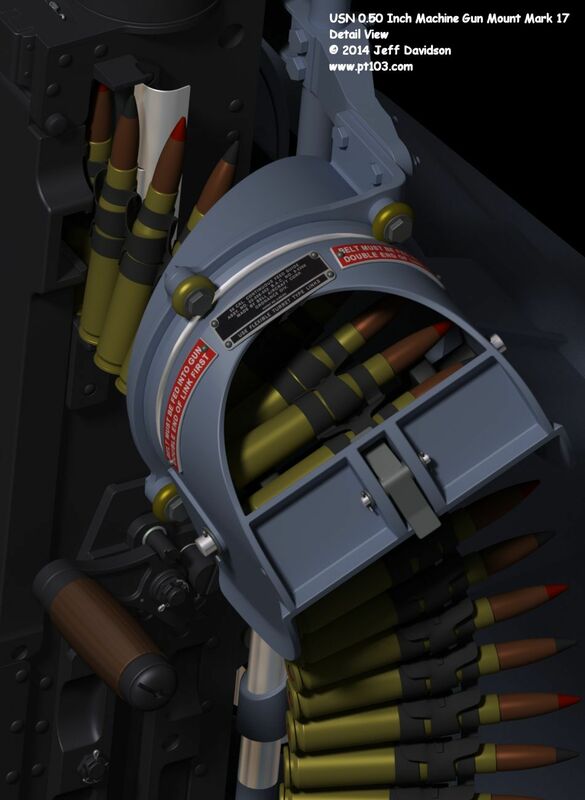 Ammunition should always be packed in the boxes so that the double loop of the link will be leading and, therefore, will be fed into the gun first. 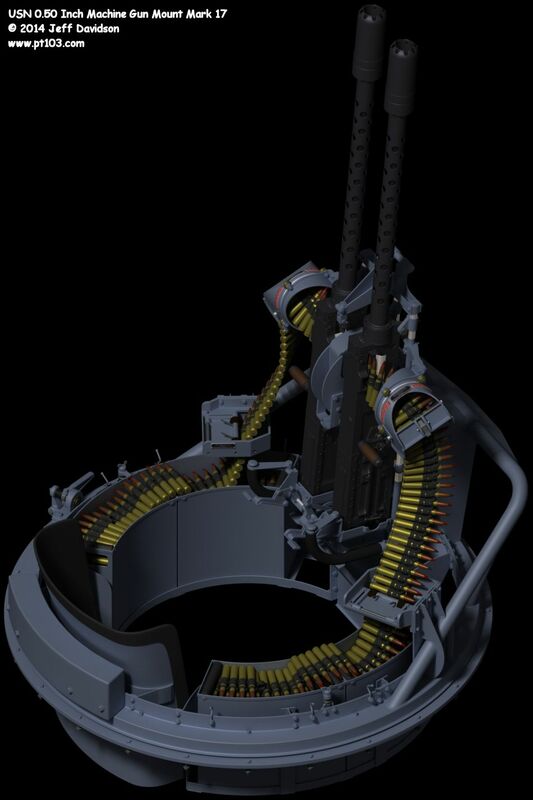 This is important because the feed mechanism of the gun will operate with a greater belt load if the double loop is fed first, for then both the cartridge-feed pawl and the holding pawl will always bear against a single thickness of the link thereby properly spacing the belt. 6. Ammunition boxes should be loaded so that the end of the first row of cartridges laid on the bottom of the ammunition box will extend up the rear end of the box with three or four cartridges hanging over the top of the rear of the box. Thus, the tail end of the belt from the front box can be connected to the front end of the belt in the rear box. 7. From the boxes the ammunition passes through lower and upper ammunition guides to the guns (see pl. 3). When the front box is empty the ammunition will feed from the rear box. Where time permits, however, the empty front box should be removed, the rear box slid forward, a full box replaced at the rear, and its belt connected to the end of the belt in the front box. 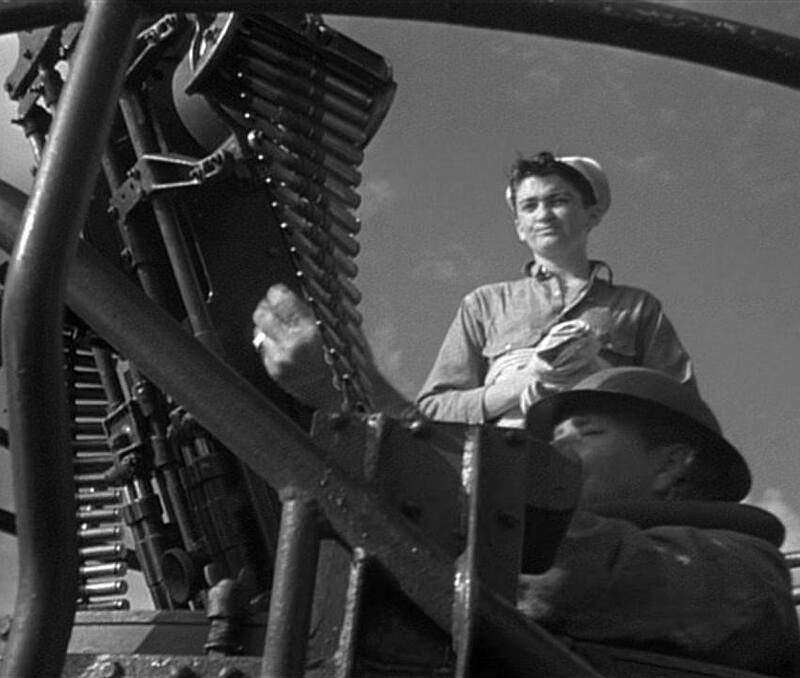 CAUTION: As the aircraft gun is used on this turret, initial bursts should be limited to 75 rounds, with a desired rate of about 20 rounds per minute thereafter. Caution should be observed against possible "cook offs" of the round in the barrel chamber of a hot gun. 8. To protect the ammunition from the weather, a canvas cover is provided that fits over the open tops of two adjacently-placed ammunition boxes. A slit in the cover permits the ammunition to pass through the cover and to feed into the guns. Although initial burst can be fired with the cover in place, it is best to remove the cover as soon as feasible when firing is done. The cover is secured in place by hooking the cover grommets on four hooks, which are attached to the support ring. 9. Spent cartridges are guided by hoppers and flexible ducts into a container. The empty links are guided into the container through the empty-link chute attached to the cradle-supporting yoke. 10. Two latches for securing the cradle are provided: one for securing the guns in maximum elevated position, and another for securing them in a horizontal position. Guns should be secured in a horizontal position on sea when visibility is low. Guns stowed nearly vertically have been mistaken for a submarine periscope. 2. The cradle frame is made up of four parallel bearers on which are assembled front and rear trunnion slides. Four shock-unit assemblies (two for each gun) are attached at their forward ends to the rear-trunnion slides. At the rear they are attached to the cradle back-plate support. 3. 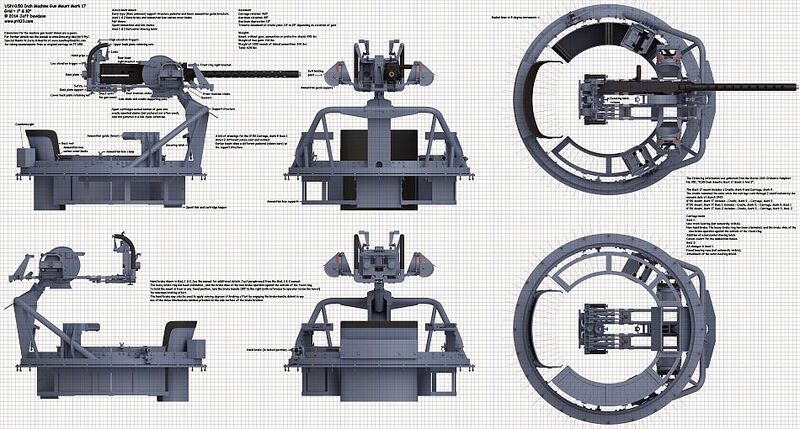 Deflector assemblies are bolted to the bearers and support a yoke and chute assembly serving both guns. Bolts holding outer ends of deflector brackets to bearers also hold continuous-feed rear brackets in place. 4. The cradle back plate houses trigger and safety mechanism, including trigger-synchronizing adjusting screws. This back plate is easily removed by loosening knurled nut on bottom of cradle back-plate support, and the two knurled screws at the top of the hand grips. 5. A sight and stowage-latch support forms the front member of the frame and is designed to accommodate a standard ring sight. 6. Provision is made for mounting a bead sight in a bracket bolted to the yoke and chute assembly. 7. The purpose of the hydraulic shock unit is to reduce recoil shock produced by gunfire. This is accomplished by combining the functioning of an hydraulic piston with the reaction of a specially-designed recoil spring. 8. When firing with gun in level position, the major portion of the recoil shock is absorbed by the action of the hydraulic piston - the spring serving to return the gun to normal position after recoil. 9. Firing at a declined angle, recoil is counteracted by the hydraulic piston and weight of gun. 10. With the gun in an inclined position, the spring offsets the weight of the gun and recoil shock is absorbed by the hydraulic piston. 11. Recoil actuates piston (B1) (see pl. 8, fig. 1) compressing the special recoil spring (B2). This movement develops oil pressure behind the piston, as shown in cut, forcing valve (B3) from its seat, thus permitting oil to flow into the oil reservoir (B4) as indicated by direction of arrows. It will be noted how air ball (B5) is compressed on recoil stroke. 12. On the return stroke (see pl. 8, fig. 2) check-valve spring (B6) forces valve (B3) closed, and pressure of air in air ball (B5) on oil forces open valve (B7) opening aperture (B8) to facilitate return flow of oil as indicated by the arrows.